After three albums in eight years of band history, REVERENCE released a live album. For “Vengeance Is … Live” they have selected a total of fifteen gems from fans that have come from shows that cover almost the entire band’s history. It was probably mixed diligently and mastered, because the sound could all come from a concert. Only fading in and out reveals that no coherent performance was recorded here. This bothers the live feeling a bit. Stylistically REVERENCE refuse the current trends, they play US Power Metal at its finest, as we would have loved it thirty years ago. Here and there a bit of NWOBHM also sounds, especially Scott Oliva’s vocal style and voice are reminiscent of both Bruce Dickinson and Geoff Tate (the latter of course has nothing to do with the NWOBHM). Probably not coincidentally, the IRON MAIDEN cover ‘Wasted Years’ is on the album. Bryan Holland and Paul Kleff are reeling, soloing and dueling themselves through the songs – but unfortunately the guitars are mixed a bit unevenly, which sometimes weakens the double-guitar-power pretty much. Russell Pzutto on bass is great, and with Steve ‘Dr. Killdrums’ Wacholz is an equally good drummer on board. REVERENCE fans should already know the song material anyway. For all others, I recommend listening to ‘Until My Dying Breath’, ‘Fire Lord’, ‘Gods Of War’ and the great SAVATAGE cover ‘Power Of The Night’. 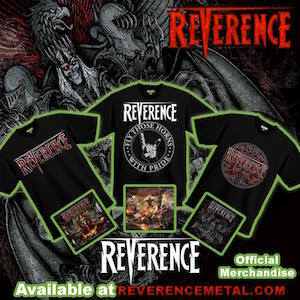 ← Previous post:New Merch Metal Shop Launched!